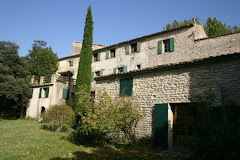 Keep up to date with what is happening in and around the Vaucluse area of Provence, France. We have a white out here in Malaucene...as the old lady who I passed en route to the village said:"c'est jolie mais ce n'est pas practique"...too right, we have had a 40 hour power cut meaning no central heating or hot water since friday morning, and we cant get the cars out to the road...hence the shot of Jude on the long trudge into the village. Lily at least is happy...no school last friday and looks like we wont make it tomorrow morning. At least the fridge and the wine cellar are full!